Self processing of color negative films in home photo laboratories is rebounding in popularity. Due to increasing demand Compard, manufacturer of the DIGIBASE C-41 CHEMISTRY, has developed special chemistry sets in close cooperation with international photographers. These sets are especially designed for beginners to facilitate self processing of color negative films, amateur photographers with medium scale film usage, semiprofessional photographers and small to medium scale professional laboratories. â€¢ Color chemistry of highest quality, based on C-41 standard process. â€¢ Economical and more environment-friendly â€“ due to the alternative of using single components. of 10, 20 or 50 films. â€¢ Due to the optimized package sizes full depletion and the maximum utilization of the chemistry within the shelf-life is possible. Extremely long shelf-life of the liquid concentrates. The various disadvantages of powder chemistry are avoided. â€¢ Even with smaller film quantities very good economy. â€¢ Exceptional attractive price performance ratio. â€¢ Due to the standardization of the C-41 system the DIGIBASE C-41 color chemistry can be supplemented without any problems with the C-41 chemistry of other manufacturers. 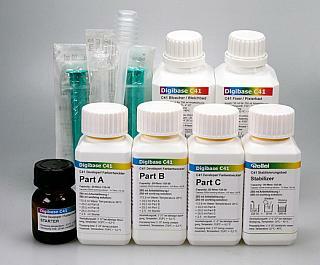 â€¢ The DIGIBASE C41 packaging is derived from specialized packagings for professional extensive use. â€¢ For the first time DIGIBASE C-41 color chemistry enables the photographer to use lower process temperatures. This facilitates the processing of color films, particularly in the private home laboratory. â€¢ The DIGIBASE C-41 color chemistry is usable for creative processes like "cross development", the development of reversal films in C-41 chemistry. In this cross process the color and contrast changes are affected by omitting and/or increasing of the starter quantities to color developers.